Traditional Greek Macedonian Halvas, is one of the main Lenten sweets. It’s main ingredient is sesame, which is turned into tahini and used to be sweetened originally with threpsini, which is a natural sweetener produced from raisins. During the War, when the Germans had confiscated all the production of raisins in Greece, other sweeteners were used such honey, caramel syrup or glucose and today fructose is also used. Halvas is flavoured with cocoa or vanilla and other flavours and is mixed with almonds, peanuts or pistachios. It is sold packed in blocks or sold by weight. It is a very good source of protein and calcium and during lent we usually eat it for breakfast but when there’s no dessert at home, it is equally good to get your blood sugar levels back to normal. My husband tells me that he remembers as a child, that halvas, sprinkled with lemon and cinnamon was served as a mezes for wine. A very simple dessert my mother would make was to crumble halvas and make it as a filling for bourekia (turnovers) with leftover phyllo. During lent I always make some usually when I have some leftover phyllo from daktyla. 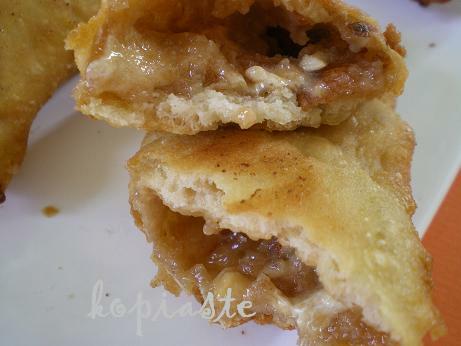 These are made quite bigger from daktyla and during frying, halvas melts and caramelizes. For this reason make sure that the filling is enclosed properly as if halvas leeks from the pastry during frying, the oil will then burn and become black. I made my own version using raisins marinated in Grand Marnier, extra almonds and lemon marmalade. All the ingredients added additional flavour and you had a bite with lemon taste or a crunchy almond here and there and a sweet aromatic raisin in another bite. Another lovely filling would be to use the cocoa flavoured halva and add small pieces of chocolate (without milk) and orange marmalade or caramelized orange peels. Marinate sultanas with the Grand Marnier for 30 minutes. Add lemon marmalade and mix. Crumble halva and add the sultana mixture as well as extra coarsely cut almonds. Mix well into a thick paste. Roll out the phyllo into about 10 cm stripes and place a tablespoon of the mixture. Roll twice and cut the phyllo. Press with a fork to enclose the mixture. Place on a floured surface and continue untill all are finished. Heat the olive oil and fry on both sides until golden brown. Place on kitchen paper to absorb the excess oil. See more Lenten recipes here. March 8 is a major day of global celebration for the economic, political and social achievements of women. We are very lucky to be born and living in countries where women are treated equally towards men. Even now in the 21st century there are still may oppressed women. There is a lot of information which you may read here. Can you believe that I have never tried halva. I have seen it in our local Mediterranean market but wouldn’t know what to do with it. Thank you for the inspiration Ivy! !Thank you also for pointing out International Women’s Day as well. I am addicted to Halva! These Bourekia must be heavenly! Nice way to use the sesame halva! As for sprinkling the halva with lemon and cinnnamon, I dimly remember the cinnamon myself, so I think your husband is right about that. I also like the semolina halva, in fact I made some the other day. Anyway, nice post with a good idea. This is a really interesting way of using and eating halva Ivy. A great idea. Greek Macedonian Halva? Isn’t Macedonian and Greek one & the same? Makedonikos Halvas is naturally always in our household, you’ve applied it here in a very novel way! Peter, regarding your question, in fact Macedonian and Greek are one and the same but since the Skopians want to call themselves Macedonians I wanted to clarify this to readers who do not know much about Greek history. I don’t even want to think what the FYROMians will do if they ever enter the European Community. Two delicious looking desserts Ivy! Some of each for me please. Happy IWD to you too dear Ivy. Can you believe that I thought the Greek halwa was a variation of the Indian halwa…till I read your post! Great marinated flavours in there…mmmmm!! Ivy this looks absolutely delicious. Halva is a very popular sweet in the Middle East, and when my father would go to the Lebanese grocer he would sometimes pick us up a little treat. The texture of halva melting in my mouth is one of the greatest joys I have known. That said, I have NEVER seen it used in a sweet before! I love how creative your recipes always are. Again, this looks deeeelightful! I love halwas and in India we have lots of variety and this i am sure i would love it made in a pastry. What a coincidence–I was going to make halva (albeit the Indian version) this weekend! This looks delicious! What a great idea Ivy! Sounds like a delicious dessert. I love halva, especially that with almonds or pistachios. Delicious!! Looks delicious to me! Happy Int’l Women’s Day! I, too, am addicted to halva! I haven’t had it in too long. I need to get some for sure. The bourekia look SO good! I’ve always wanted to make my own halva and I think this is a fine use of the delicious sweet. Yet another beautiful recipe from your kitchen. What a gorgeous dessert! I love the photos :). I stumbled upon this blog post while searching for the best recipe for halva paste or cream to use in my sour dough cake. I remember my grandmother's uncles owned a pastry/sweets shop in Salonika back in the day, and I trust that Greek sweets can be very good. So I enjoyed reading this entry until I saw your comment on Macedonia – the country where I happen to be from. I don't wish to respond to any of your inciting remarks, but to tell you that you have just ruined it for me. No need to politicize a food blog, this should be a pleasant and unbiased experience for all people globally. p.s Frying is not that healthy. It is your country's propaganda which forces us to add comments like that. You have nothing to do with the real Macedonians. You are slavic who came to live in that region which was Greek for millenia, so start calling yourselves FYRO -Macedonians and we will have to problem with that.